What started out as a simple gesture by Patrick DeFeo, a realtor in Manatee County Florida, has quickly turned into a national movement. 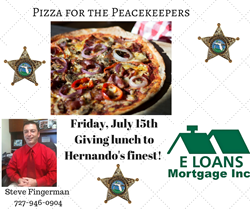 He shared his story and gesture with his friend, Steve Fingerman from E Loans Mortgage and the gesture of kindness to local law enforcement quickly turned into a national movement with over 30 loan officers nationally now participating. What happened in Dallas rocked the nation and once again showed, just how fragile life can be. It also serves a reminder to everyone of how local and state Policemen and Policewomen put their lives at risk every day to serve their communities. Most of folks go about our lives and never give that risk a 2nd thought until something as tragic as Dallas makes it difficult, if not impossible to ignore. He shared his story and gesture with his friend, Steve Fingerman from E Loans Mortgage who had the idea to turn into a national movement and shared his plan with a group of Mortgage Loan Officers across the country. The group consists of some of the most trained Loan Officers in the Country who network to collaborate through the group and share ideas and knowledge. That’s when one of its members, Michelle Dugan of The Mortgage Connection in Madison Mississippi suggested the group pick this up and do the same in their respective towns and states. The suggestion caught on immediately and before long the Loan Officers in this group who are spread across the country started collaboration and agreed to participate. 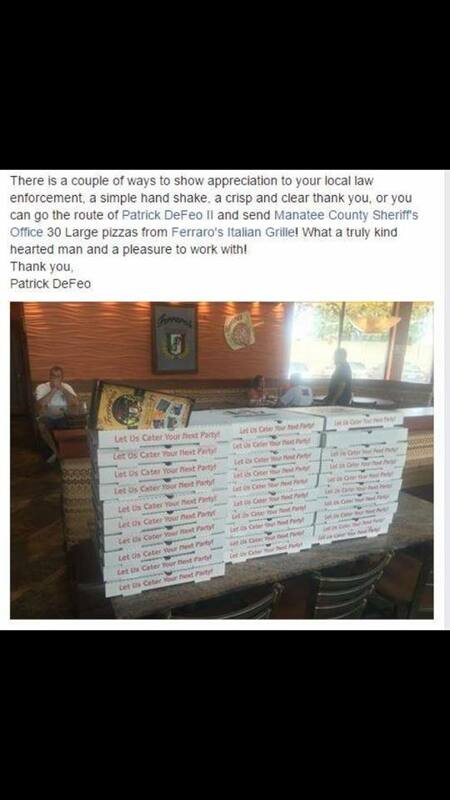 Within a couple of hours over 35 of the top mortgage professionals in the country started coordinating efforts to send pizza’s to their local Sheriffs, Highway Patrol, and Police Departments as a way of saying thank you and showing support. Evan Wade of Movement Mortgage in Egg Harbor Township in New Jersey says “I saw the idea posted and immediately thought, heck yes let’s do this” He goes on to say, “Our brave men and women in law enforcement put themselves out there every day, and I know many times it could probably be a thankless job, so when I saw the opportunity to give back, I thought it was fantastic”. Indeed what started out as a single gesture from one person was now growing into a national movement picked up by a group of Mortgage guys who decided that they as a group can make a bigger impact. Chasity Graff of LA Lending LLC in Baton Rouge, LA says “she got in on it hoping it would inspire others around the country to do similar things. I don’t necessarily want people to send pizzas or even spend any money, I know not everyone can do that, but what I do want is for people to be aware. Be aware of what your local law enforcement officers go through daily and be thankful in a way that they can see it. If all of us went out of our way just a little bit to show our appreciation and support it would have the potential to bring tremendous positive change and that is what I think the country needs right now” Chasity was on to something because when these Loan Officers, reached out for help from their local community other people and businesses starting to jump on board by offering their foods at cost or providing other things that their local Sheriffs, Highway Patrols, and Sheriffs needed more of. While many people tend to think they can’t make a difference in the world, this group of mortgage pro’s scattered across the country is proving otherwise. Their joint effort and collaboration has resulted in over 35 people in 35 different towns across the country bringing localized awareness and gratitude to their local Sheriffs, Highway Patrol and Police Departments. Thank you to the following Loan Officers and Lenders across the country!! !